Australia! Land of kangaroos and aborigines and didgeridoos. A shell-shaped opera house. Pristine beaches, fish and chips, box jellyfish, breathtaking harbors and boomerangs. Oh, and we can’t forget the Outback! Australia’s own heart of darkness, a ghastly blank, wild, expansive and arid interior. The kind of rugged terrain only a well-rigged 4×4 should tackle. I hear there’s a large rock out there. the aborgines have the oldest continuously maintained culture on Earth? They inhabited Australia at least 40,000 years before the first Europeans arrived. of the world’s ten most poisonous snakes, all are Australian? five of its creatures (the box jellyfish, blue-ringed octopus, paralysis tick and stonefish) are the most lethal of their kind in the world? no other nation lost more men in WWI as a proportion of population? Australia boasts the longest straight stretch of railroad track in the world, 297 miles without a hint of deviation? I was exhilarated to visit such a fascinating country. My first stop was Perth, capital of the Western Australia state and one of the world’s biggest exporters of minerals. Gold, nickel, alumina, iron ore, mineral sands, coal, diamonds–you name it. Also, due to its severely southwest geography, Perth is one of the most remote major cities in the world, over one thousand miles from Adelaide, the nearest notable city. Perth is a city of suburbs. Fremantle and Cottesloe, Subiaco and Northbridge. This photograph was taken in the CBD (central business district). 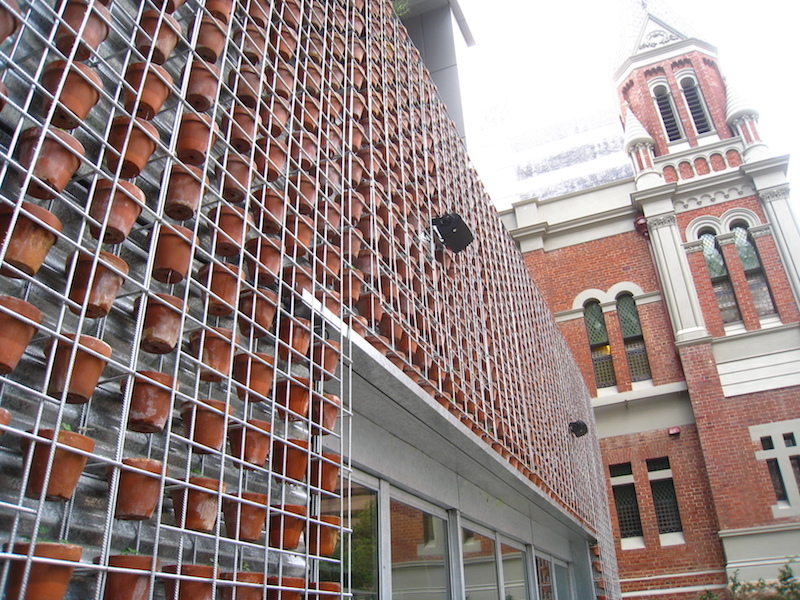 An entire outer-wall of potted herbs? Very cool. 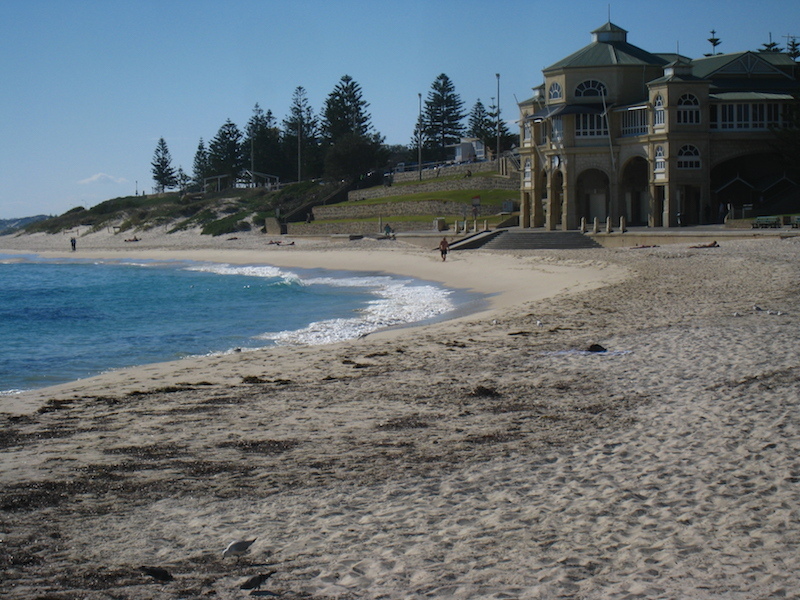 While I didn’t have much free time in Perth, I snuck away one afternoon to Cottesloe, a western suburb famed for its pristine beaches, laid back atmosphere and fish and chips. On a Tuesday afternoon, there wasn’t much to see, but from what I’ve heard, Sundays are quite lively. I spent an hour or so on the beach, reading, listening to music, feasting on fish and chips like there was no tomorrow, eventually walking south to Fremantle. Sydney is, in a word, breathtaking. Certainly one of the world’s most impressive cities. With one third of its residents having been born in another country, Sydney is diverse in the finest sense of the word. All kinds of cuisine and people, neighborhoods and architecture. Life cannot offer many places finer to stand at eight-thirty on a summery weekday morning than Circular Quay in Sydney. To begin with, it presents one of the world’s great views. To the right, almost painfully brilliant in the sunshine, stands the famous Opera House with its jaunty, severly angular roof. To the left, the stupendous and noble Harbour Bridge. Across the water, shiny and beckoning, is Luna Park, a Coney Island-style amusement park with a maniacally grinning head for an entrance (It’s been closed for many years, but some heroic soul keeps it spruce and gleaming.) Before you the spangly water is crowded with the harbor’s stout and old-fashioned ferries, looking for all the world as if they have been plucked from the pages of a 1940s children’s book with a title like Thomas the Tugboat, disgorging steams of tanned and lightly dressed office workers to fill the glass and concrete towers that loom behind. Just working out the principles necessary to build the opera house roof took five years. I spent an afternoon walking through the Royal Botanic Gardens, just east of Circular Quay. 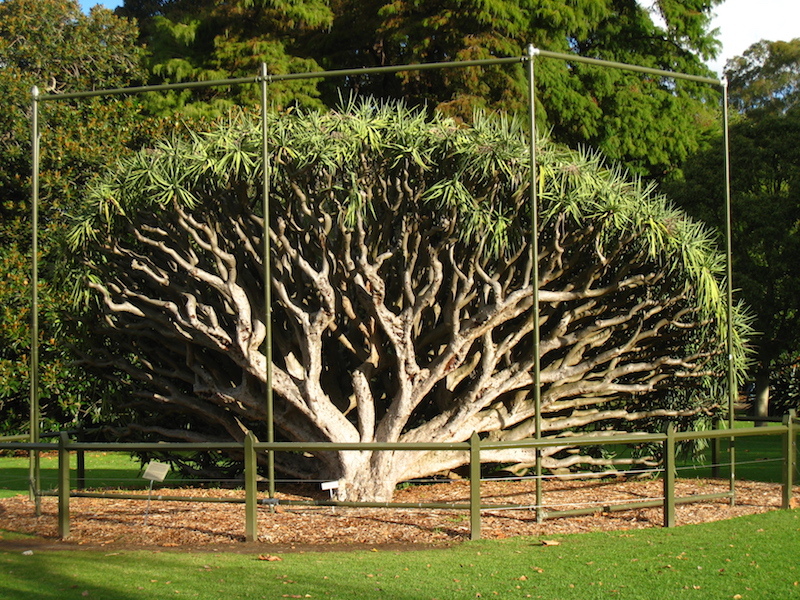 The Dragon Tree (Dracaena draco), native to the Canary Islands, was one of the more interesting trees I saw. This particular one is over 100 years old and actually fell over in May 2008, hence the protective barrier. 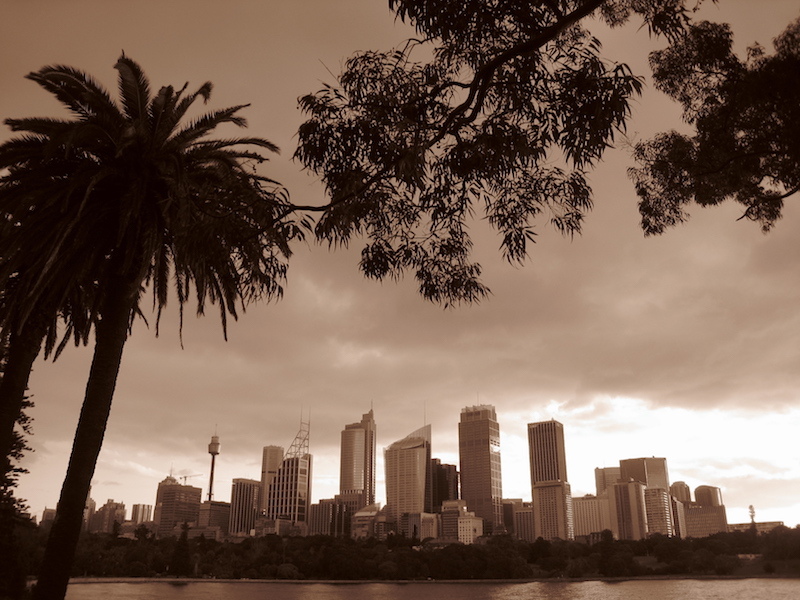 This was also taken in the Royal Botanic Garden, looking back at Sydney proper. 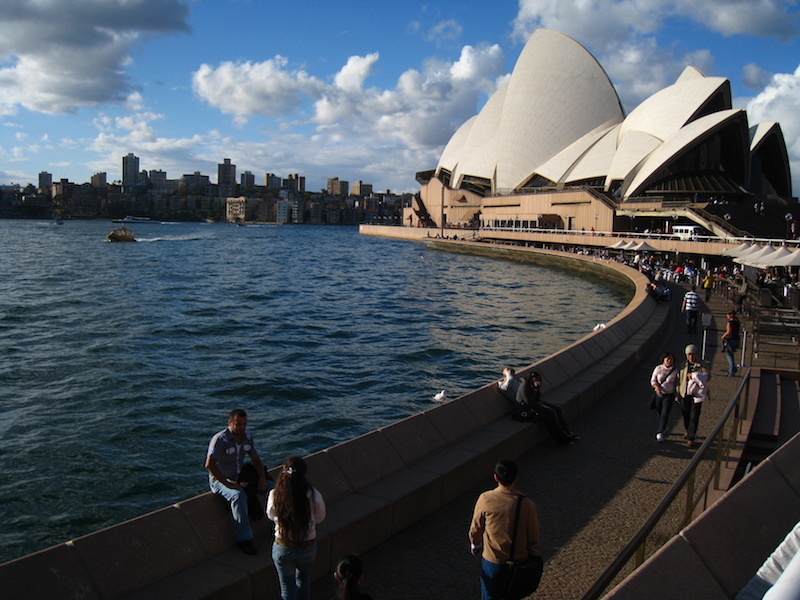 The aquarium, one of the largest in the world, attracts around 55% of the tourists that visit Sydney each year. 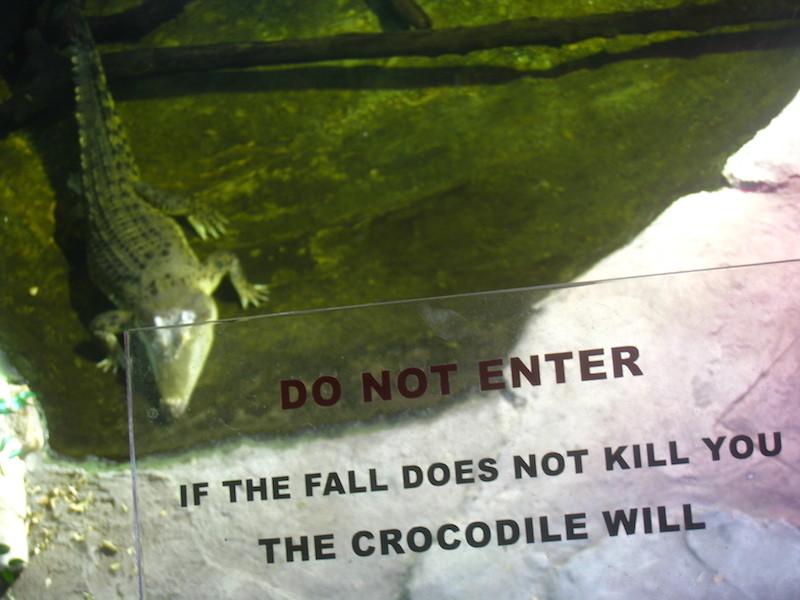 While I wasn’t particularly impressed–it’s old, cramped, dim and there’s not enough emphasis on Australia’s dangerous sea life–I enjoyed the one crocodile they had on display. My last night in Sydney, I met up with Steve and Scott, both relatively new to Sydney (one from the U.K., the other from Melbourne). We grabbed food and drinks, listened to live music and chatted about business, academia, blogging, travel and music. It wasn’t until Scott brought up Intellectual Ventures, a conglomeration of super geeks that try to solve the world’s problems, that I realized how much fun I was having. Sure, call me a geek, but to be halfway around the world, chatting with complete strangers, quasi-inebriated with both alcohol and atmosphere–something hit me. This is what travel is about. Exploring. Meeting people. Engaging with the world around us. Growing. Already looking forward to my next trip in a few weeks. Stay tuned. Glad you enjoyed your time in Australia. It’s always refreshing to read foreigners travel stories about your own country – really reminds you of everything that you take for granted in your home town. Take care, see you when you’re next out here! A whole wall of potted herbs, eh? Very cool. I actually didn’t even notice what that was until you wrote it. It’s funny that I just started reading this post while watching an episode of No Reservations and Tony was in Melbourne and Sydney. Not my favorite episode of his, but the food looked great. It does seem like a country that would take quite a while to explore thoroughly, as it has so many different aspects and varying landscapes. Great article! Enjoyed this one. I never realized that Sydney was as diverse as you say…I’ve always claimed that Melbourne was the most diverse (based upon my observations only!) city I’d ever visited but I doubt that 1/3 of the population was board elsewhere. Exploring & meeting people has to be my favorite aspects of traveling. Always so much to learn & see and so many unique people to meet. It’s awesome. That little info-byte on snakes was enough to ruin my hopes of going to Australia…I HATE Snakes…ughhh. That crocodile sign is sweet too.